A vehicle owner has the right to make an auto diminished value claim against the insurance company of an at-fault driver who causes damage to their motor vehicle. The term “diminished value” means your car is worth less after being repaired because of the bad Carfax vehicle history report. Naturally, consumers prefer buying used cars that weren’t previously wrecked. Automobile dealerships are usually the ones to break the bad news to new car buyers bringing trade-ins. Because of previous repairs, sometimes regardless of how minor the damage was, dealers are forced to offer thousands of dollars less for these cars. This also applies to cars that were repaired perfectly – a bad Carfax is a bad Carfax and that’s enough to dissuade most potential buyers. The majority of dealers don’t even bother attempting to retail these vehicles and usually send them straight to auction. Wikipedia tells us that a diminished value appraisal evaluates the difference in the value of a motor vehicle after a collision repair. Obtaining an automobile diminished value appraisal from a licensed appraiser is the first step toward recovering your car’s lost value. Here is some more information you should know before proceeding with your claim. Q: How is The Auto Diminished Value Appraiser different from other appraisers who prepare automobile diminished value reports? Formulas such as Rule 17c use what is called “damage modifiers” that assign points according to severity of damage and mileage. Auto diminished value appraisers using this formula must, naturally, use higher modifiers than insurance companies would. This simply creates a controversy over whose formula is right. The same goes for so-called algorithms. The Auto Diminished Value Appraiser obtains its data directly from the sales managers at automobile dealerships – experts who buy, sell, trade and auction cars every day. In our query, the year, make, model, mileage, color options, amount and nature of damages is discussed. Based on that information, a dealer can determine exactly how much less he would pay for the car. We compile six dealer quotes and by averaging their deductions, this is how our automobile diminished value figures are created. It is clearly noted in our reports that all of the dealers queried are told that the subject vehicles are not available for purchase or trade, therefore, none of the dealers queried have any vested interest in the subject vehicles. It takes five minutes to run off a list of auction results and even less time to concoct a formula for diminished value. While our method is far more time consuming, the resultant diminished value reports are virtually irrefutable. Should an insurance adjuster opt to spend a half-day soliciting new car dealers they would come up with the same results. A Diminished Value Report from The Auto Diminished Value Appraiser is the closest you can come to establishing the exact amount of diminished value. Our clients receive much fairer treatment from insurers. Such compelling evidence forces their consideration. Q: Regarding your sources of diminished value quotes, are the new car dealers part of a network? A: No. Using a network of new car dealers for quotes could constitute collusion so we choose dealerships at random, consulting with sales managers from six local dealers to determine diminished value. Q: How do I order an Automobile Diminished Value Report from The Auto Diminished Value Appraiser? Q: How much does it cost to use The Auto Diminished Value Appraiser to prepare an Automobile Diminished Value Report? A: We charge $275.00 regardless of whether your diminished value comes to twenty-five hundred or twenty-five thousand dollars. You will find that most of our competitors charge a lot more. There are, of course, companies who offer instant reports for a low fee. While these are good for general knowledge, they are worthless for the purposes of proving diminished value in order to settle an insurance claim. Note: The cost for a diminished value report for a Bentley, Ferrari, Tesla Motors or other exotic vehicle is $350.00. For comparison purposes, independent appraisers rates for preparing automobile diminished value reports range from $39.00 to more than $800.00. While neither of these figures guarantees you a comprehensive report based on six dealer quotes, it should be pointed out that submitting either a low cost report or a do it yourself quote from a car dealer sends a message to the insurance adjuster. You are frugal, and since there is little likelihood of your paying an attorney to sue them in court, you will be treated accordingly. Q: Does our appraiser need to see the repaired vehicle? A: No. All parties assume that the vehicle was repaired correctly. Unless you have issue with the repairs, no inspection of the repaired vehicle is needed for an inherent diminished value claim. For INHERENT DIMINISHED VALUE claims, a physical inspection of the repaired car is unnecessary and only serves to line the appraiser’s pocket as you will be charged more for this service. The car is fixed. Repairs were satisfactorily done. There’s nothing to see. Let’s move on to why your car is worth less – because it now has a repair history. In the case of REPAIR-RELATED diminished value claims, which is a loss of value because of shoddy repairs we will send an appraiser because a physical inspection is, indeed, necessary. Your claim, as well as 99% of diminished value claims, represents INHERENT DIMINISHED VALUE which is the loss of value because the vehicle now has a repair history or bad Carfax. Q: Is it necessary to use an appraiser who is licensed? A: No. While anyone can prepare diminished value reports, an appraiser holding an insurance adjuster’s or insurance appraiser’s license from any state is considered an expert in the field. There are, of course, other designations from private organizations that charge a fee for an appraiser to become “certified” or “accredited.” In court, there is no substitute for the credentials of a state-licensed insurance adjuster and appraiser. Q: What if the accident happened a long time ago, can I still collect for diminished value? A: In each state, the statute of limitations for filing an automobile diminished value claim varies. Check with your state’s insurance department for this information or give us a call. A: No. You may elect to hire a lawyer from the outset but it makes fiscal sense to file your automobile diminished value claim yourself. Our reports usually result in satisfactory claim settlements, however, after submitting your report to the insurance company, if you feel that their offer is inadequate or you are being treated unfairly, that would be the time to spring for a lawyer to work on your behalf. It should be noted that our experience testifying as an expert witness has revealed that insurance companies have been ordered to pay for the independent appraisal fee, the expert witness fee and for the claimant attorney’s fee in addition to the amount of the diminished value. Q: If I have an accident that is my fault, can I make an automobile diminished value claim against my own insurance company? Q: Will The The Auto Diminished Value Appraiser act as my designated representative? A: As a client of our firm, you can be assured that we are prepared to discuss our appraisal process at length with the insurance adjuster upon request and appear either in person or via teleconference as an expert witness to defend our findings as both legitimate and unbiased. Q: Is the diminished value figure based on my car’s retail or trade-in value? A: In order to be fair to all parties and also to make our reports more acceptable to insurance company adjusters, we use trade-in values as a starting point. Should you decide to pursue your claim on the basis of retail value, the percentage of the diminished value remains unchanged so you may simply apply it to the higher retail value of the car. Q: Does diminished value apply to rental cars? A: In most states, automobile insurance policies do not provide coverage for diminished value. Credit card companies also do not pay for DV. If you wreck a rental car without signing up for the additional insurance offered by the car rental companies, you are on the hook for both diminished value and loss of use. Your costs can be substantial – well into the thousands of dollars. Q: In what states are The Auto Diminished Value Appraiser’s services available? A: Our automobile diminished value appraisals are sought after by car owners all over the country. 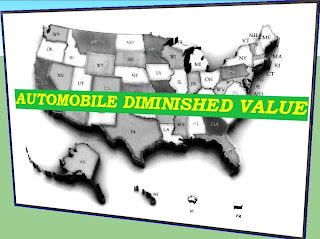 We provide automobile diminished value reports in all 50 states. TESLA AND OTHER EXOTIC CAR OWNERS PLEASE CALL FOR RATES.